Something happens to you as you walk the picturesque streets of Ludlow, known off-record as one of England’s prettiest towns. One minute, you’re an urbanite trying desperately to find a flat white that doesn’t convince your soul to just keel over and die, and the next, you’ve soaked in enough of the South Shropshire countryside to find yourself wandering around in a middle-aged, pearl-and-twin-set haze saying things like, “It has real chocolate-box charm, doesn’t it?” and “Ooh, look at those lovely exposed beams!”; it all feels like a still from Escape to the Country (you know you know it). This is the power of Ludlow. For the uninitiated, the medieval town is located bang on top of a cliff overlooking the River Teme and surrounded by the Welsh Marches, as well as that aforementioned gorgeous green countryside. 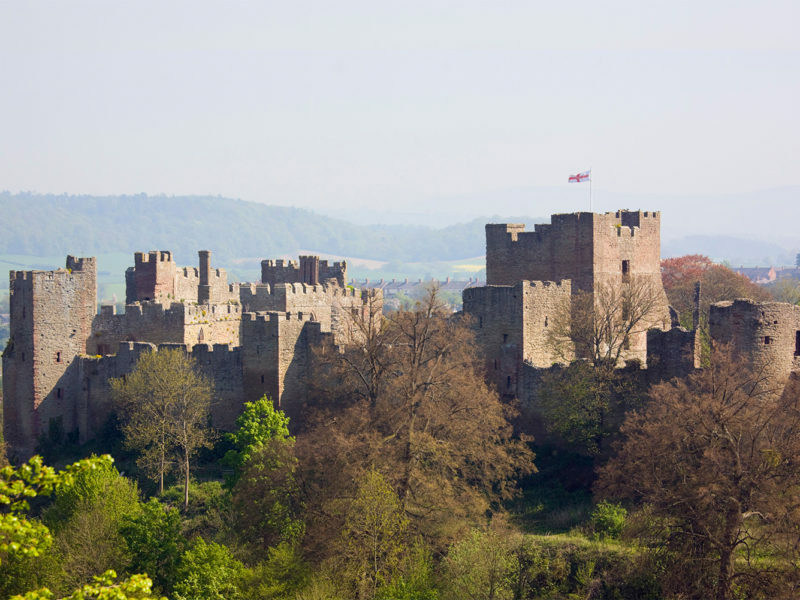 It’s famous for its food and wine, including the annual Ludlow Spring Festival that promises revellers over 200 varieties of real ales plus cider, perry (similar to pear cider) and wine, more than 60 local food producers, live music and hopefully, a decent flat white or two. We could talk about the lengths members of Ludlow and District Chamber of Trade and Commerce went to in order to boost the image of Ludlow and surrounding areas or how the popular festival, established in 1995, helps promote the area’s terrific artisan food and wine producers against the backdrop of the town’s historic castle, but instead we’ll just say: sausage trail, cake competition, ale trail, pork pie competition. There’s a reason the town’s population doubles from its usual 10,000 at this time of year – why not make it 20,001? In England, it’s hard to visit a simple corner store without tripping over a castle, but gosh this one is pretty. Construction on this privately owned castle began in the late 11th century and over the centuries it hosted everyone from Prince Arthur, brother of Henry VIII, who honeymooned here before his untimely death, to Henry’s daughter Mary Tudor, who spent three icily cold winters here. Although it fell into decay, many of its buildings still stand and historians note that it’s a castle where its history is very much reflected in its varied architecture (everything from medieval to Tudor). Top tip? Rug up because it is seriously cold at the top (also a good rule of thumb for life, kids) and warm up afterwards by sipping a hot tea at the Castle Tea Room beneath. It’s difficult to put this delicately, so here goes: come all the way to Ludlow so you can experience the world’s greatest truck stop. It’s not just any kind of truck stop, of course, but a gourmet wonderland located on the Earl of Plymouth’s 3000-hectare Oakly Park Estate just off the main road on the outskirts of town, which features a play and picnic area, the Clive Arms restaurant and boutique hotel (highly recommended), and on-site cafe Ludlow Kitchen (also highly recommended). There are countless reasons to stop by the food centre, but the number one reason is surely Ludlow Pantry, a delicatessen that will leave you gasping at the wonders of culinary life. Just think of a smart food hall filled with the smell of freshly baked Cornish pasties, serving up hundreds of varieties of cheese, meats, baked goods, fresh produce and conserves. More than 30 per cent of the food sold here is handmade on site, with a further 30 per cent sourced from Shropshire and its surrounding counties. Load up your suitcase; it’s worth making an appearance on Border Security for. I’ll admit it, I’m a big fan of the English. Not only is my husband originally from England, so are many of my exes and some of my best mates. But I have to say the locals are some of the best people I’ve ever encountered. To illustrate the point, here’s a short tale: I fell in love with what could be the world’s craziest hat at Ludlow’s open-air market, yet walked away without buying it. When I went the following day to purchase said hat just before I was due to leave town, the vendor was not there. The story could have ended there, but it didn’t. Another vendor who heard my woolly plight alerted Tony, the market manager who then called vendor after vendor at home until he found the maker, Heather, who then drove 40 minutes from her home to meet me with a bagful of hats slung over her shoulder. She then drove 40 minutes home, happy that I’d reconciled with the World’s Craziest Hat. That’s Ludlow. On paper, Dorothy Nicolle is a qualified Blue Badge guide for the Heart of England region, and a local author, but to me, she’ll forever be known as a national treasure, ready to put herself on the line when it comes to promoting the exquisite towns of Shropshire. Rather than wandering aimlessly around town, engage the services of Dorothy and she can run you through one of her extensive, and incredibly thorough tours that include everything from ‘Shropshire’s oddities’ (of which, she informs me, there are many), to ‘People immortalised on pub signs’.